Trailing second from bottom Cobh Ramblers by eight points, Salthill Devon will be hoping to register their first victory of the Airtricity League first division when Athlone Town visit Drom. The midlanders have been solid, if not spectacular, in the early weeks of the campaign, accumulating 14 points from 10 matches. Devon have been punished in seven of their fixtures, only drawing the other three, so they need and crave a positive result. Low on confidence, Salthill require a drop of encouragement because it has been a competitive season at this level with the majority of the teams evenly matched. At the moment Longford Town appear to possess that little bit of extra craft, but a half dozen points separate Mervue United and Cobh, who sit in second and seventh place respectively, confirming how tough and demanding an environment it is. Salthill, though, were soundly beaten 3-0 at Ferrycarrig Park by Wexford Youths last Friday as their sloppy start allowed the hosts strike twice in the opening quarter of an hour. From that juncture on Salthill were forced to play catch up and they never properly recovered. It will be a busy few days for Salthill at Drom as they also host St Patrick's Athletic in the EA Sports Cup on Monday at the same venue. Buoyed by another smashing success over Waterford United, Mervue, keen to maintain their decent form, make the trip to Ballybofey for a collision with Finn Harps. In the past two months Mervue have been efficient and enterprising as Johnny Glynn has constructed a side that is proving hard to defeat. 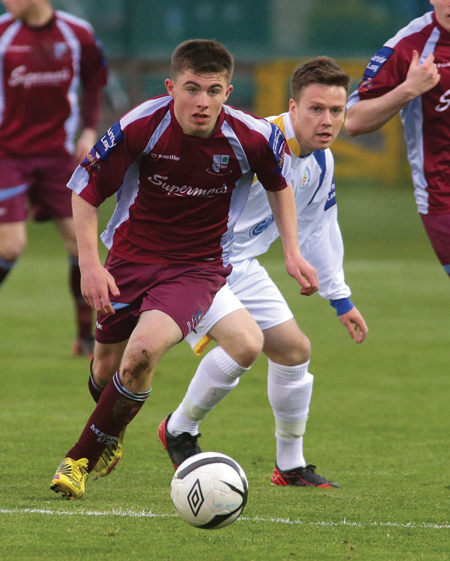 Central to Mervue's rise has been the electric emergence of Ryan Manning, who is attracting strong cross channel interest. Glynn deserves respect and credit for introducing Manning to the senior game in this country at such a young age and he contributed handsomely during the Waterford triumph. Prolific in the underage ranks, Manning is earning plenty of admirers for the significant potential that he is demonstrating on a weekly basis. Mervue will also travel up the N17 again on Monday for an EA Sports Cup tie with premier division standard bearers Sligo Rovers, so Glynn's players face two tricky assignments over the weekend. Considering that Mervue have only suffered one defeat so far in 2013, they will make those journeys with hope and a little quiet expectation.